“I had 5 different doctors seeing me in the hospital and nobody told me anything”. Of course, the doctors who saw him would probably say, “But I did talk to him”. It’s mostly a matter of perception and point-of-view. •	The doctor’s explanation may have been full of medical terms that the patient didn’t understand. The patient doesn’t want to appear stupid, so he just nods his head and acts like he understands. •	The explanation may have been too simplified. The patient wanted more details. •	If the doctor looks like s/he’s in a rush all the time, the patient will be less likely to ask questions, so as not to “bother” the doctor. •	The patient may never be given an opportunity to ask questions. •	Patients may be told a lot of things that they won’t remember. This is a foreign subject to them. They don’t live in the health care setting every day as we do. A patient may think s/he understands when the doctor is explaining it, but later when the family asks about it, s/he can’t really explain it or even remember it well. •	There are lots of distractions, especially in a hospital setting, that will prevent your patient from remembering what’s been said. Hospital personnel are walking in and out. The patient in the next bed is talking with family members. The TV is on. Fire drills are going off. It’s no wonder the patient can’t remember what been said to them in a 5 minute conversation with the doctor. •	Anxiety may decrease the ability of your patient to remember what the doctor has explained. Once they hear the words, “You’ve got a nodule in your lung”, the rest of the conversation goes out the window. How do we get around these interpersonal communication blockades? •	Sit down. Spend a little time explaining things in terms you are sure the patient will understand. •	Draw pictures and leave the pictures with the patient. Surgeons like to do this, which is great. •	Show the patient his/her X-rays if you think that might help. 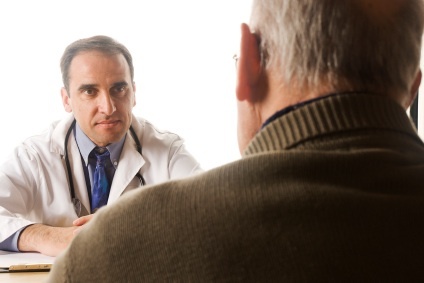 •	If the patient has some cognitive difficulty, make sure there is a family member or caretaker present, especially if you are discussing serious matters that require a major decision. Or, if not present, get the approval from the patient to call a family member. You may even ask the patient to repeat back to you an important fact that you want to be sure s/he understands. •	Even if there is no cognitive impairment, with your patient’s approval, it still may be a good idea to call a family member anyway with an update. Keep them in the loop. You want them to be on your side so you can work as a team to get the patient well. You will remember this when a daughter or son becomes angry because no one has told them anything about what’s going on with their 82 year-old mother or father, even though the patient seems very capable of understanding everything. •	Be a teacher. Explain why you think the patient has this or that diagnosis, or why you think a particular treatment would be the most beneficial for him/her. •	Ask if your patient has any questions and wait a reasonable time for him/her to think of one. I know these points about doctor-patient interpersonal communication are fairly basic. We all know about them; but we often don’t pay attention to them. As a result, patients get confused, families get upset and, before you know it, you have a major problem on your hands. You may think this has nothing to do with the actual medical care that the patient is receiving, but you would be wrong. If you haven’t been a good communicator, the irritated or confused patient will be much less likely to peacefully comply with things that you think are important in his/her care - things like blood drawing, radiologic testing, operative procedures, etc. Nurses and/or other caregivers won't understand your plans or goals for the patient. Families may become anxious and needlessly worried and may even unintentionally begin interfering with proper patient care. If you practice and incorporate good interpersonal communication skills into your daily interaction with patients and their families, you will have overcome a huge barrier in the doctor-patient relationship that will ultimately foster that relationship immensely. This page was last updated on Feb. 8, 2009. From "Interpersonal Communication" back to "Communication in Health Care"
From "Interpersonal Communication" to "HomePage"